When your man looks at other women, you may go crazy and feel sick to your stomach and unworthy of love. The brain of a male is wired to be visual as males have been hunters since ancient times. The primitive male hunted for a living and his main weapon was his eyesight or vision. It is found that the brain of a male is stimulated by visual images much more in comparison to a female. If there is an interesting image in his vision’s vicinity, he will look at it. His brain is wired for this kind of behavior. Hence, if an attractive woman appears in the range of your man's vision, he will definitely look at her. This does not imply that he thinks you are less attractive or he is not in love with you. What's more, as long as you are the individual he loves, dates, adores and sleeps with, you don’t have to worry about him looking at other woman. According to scientists, one of the most important differences between the brains of men and women is that the area of sexual pursuit in male brain is around 2.5 times greater than the area in a female brain. Males have 6 times higher levels of testosterone than females in their blood stream. According to researchers at the Columbia University, the impulse control area of the brain is impaired by testosterone, implying that men are likely to look before thinking. According to a story by David Deida in The Way of the Superior Man, a group of men were asked in one of his seminars whether they would like to look at a magazine with fifty pictures of the prettiest woman in the world or at a magazine with fifty pictures of different women who are reasonably attractive. Each man in the group said that he would prefer the magazine with more variety of pictures. Even the most beautiful woman in the world has to deal with men looking at women not as pretty as her. So, you should not get tricked into thinking what to do about it, no matter what your looks are. It may sound tempting, but you should resist the temptation to jab an elbow by his side, shoot an icy stare at him, or give him a silent treatment. Also, do not pass bad remarks about the women he is looking at because those wouuld only suggest that you are insecure and can lead to an unnecessary argument between you and your man. 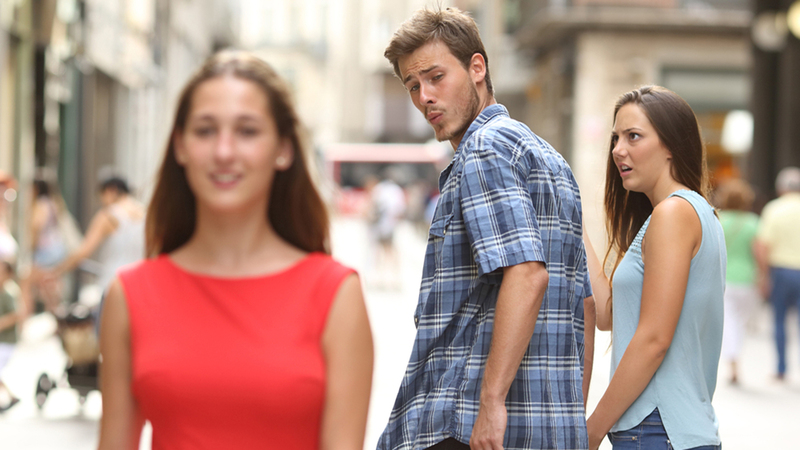 Why do men look at other women? No matter what the reason is, this is just a fleeting thing and don't let it catch you. As put by Dr. Brizendine, males stare at pretty females in the same way as females look or stare at pretty butterflies. The brain of the males is attracted to the pretty female for a second, but then they go out of his brain fairly soon. It is better to draw attention to it and acknowledge it in a loving and playful way. Your man will shift his focus back to you very fast. Remember that your man is with you and is in love with you.